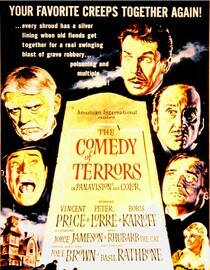 Featuring: Vincent Price, Peter Lorre, Boris Karloff, Basil Rathbone. Director: Jacques Tourneur. Over the Halloween weekend I went on a bit of a Vincent Price binge. So if you aren't a Vincent Price fan (and really who isn't?) you may want to stay away from here for a week or so. In The Comedy of Terrors, everyone's favorite b-horror movie star runs a funeral home and when business gets slow decides to start making sure more people are dying in his town. This was a pretty funny horror comedy and the cast is wonderful. Peter Lorre, Boris Karloff and Basil Rathbone are all wonderful and the comedic, creepy chemistry between Lorre and Price is worth the price of admission alone. If you haven't had enough of Halloween yet, give this one a look. Click to add this movie to your Netflix queue. Is it artsy? No, its Vincent Pricey. Best thing about the movie? The chemistry between Price and Lorre. What mood should I be in to watch this movie? In a silly mood.